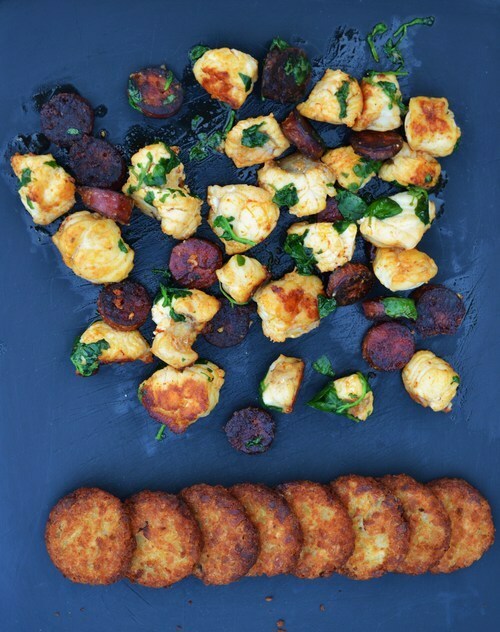 Serves about 3-4 people, as a light dinner, served alongside some potato cakes and salad. 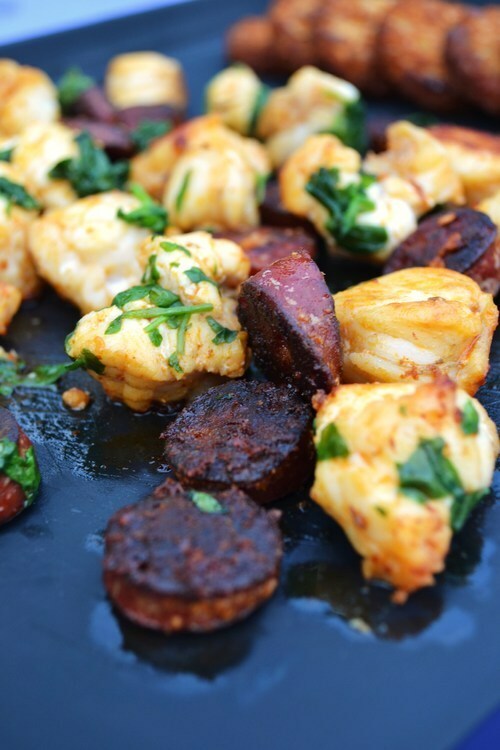 This is one of my favourite ways to cook monk fish, as the heavy fish is perfect for mopping up the strong flavours and oils of the chorizo, so it doesn’t need so much more after that. About one monk fish “tail” for each person, maybe another third too if you’re being generous. Mince some garlic and add the to the hot pan, along with the chorizo. Fry on one side for about two minutes or until a sort of crust is formed on the bottom, and flip all pieces over to its other side. You should see the chorizo forming a orange-y yellow oil on the bottom of the pan. Swirl that around the pan. Add the monk fish and I will tell you now; monk fish is one of those fish were you will think surely, it must be done by now? No. That’s unlikely, unless you’re a person who usually cooks things until it resembles a hockey puck.Once put in, let it cook a bit on that side — about a minute perhaps — before turning anything. Try to get the chorizo oils to coat the fish pieces. Monk fish requires a bit of time, even in small chunks so rather than suggest a time for you and get it completely wrong, choose the thickest, largest chunk of the bunch when you think they’re ready and cut into it. The flesh should be opaque, and bounce very little when you press against it. Sprinkle with the chosen herb and serve up. Thank you for commenting, my father would definitely agree with you on the heart business! I remember catching one in my younger years one summer out at sea, I was absolutely terrified of the beast…but it does cook up wonderfully, I find this combo to be one of our tried and tested classics these days. You can now sign up with your email address to allow updates, if you like! Let me know if you encounter any problems, but clicking the button on my homepage should work. HTH!